Last week investors were disappointed by German macro-statistics: the level of retail sales has decreased sharply, amounting to -0.8%. At the same time unemployment rate in EU fell, amounting to 12.1%. Despite ambiguous fundamental data, which is not favourable for Euro, technical analysis shows that European currency is likely to grow. Euro is going to be under pressure from the decision of the US Fed about QE program. As soon as the program will reduced officially Euro will decline. On Friday 6 December the US unemployment rate will become known, which is the key indicator for making decisions on monetary policy. Unified European currency has started this week at the closing level of the previous week. 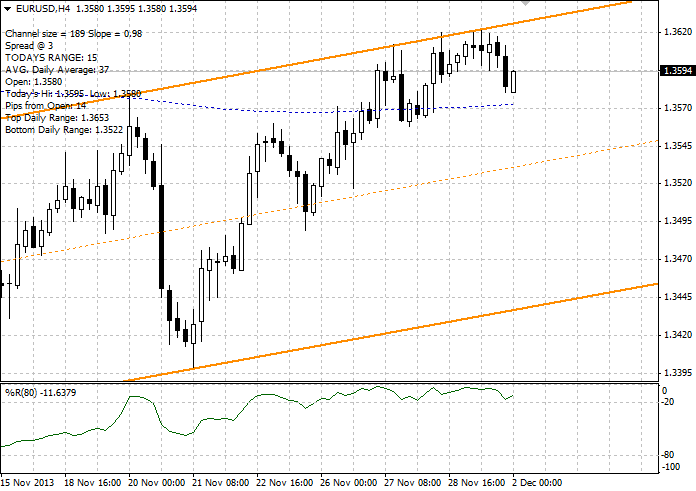 Ascending movement continues with the strong support at the level of 1.3570 (moving average with the period 200). Resistance level is the upper boundary of the trading channel at the level of 1.3620, which the price repeatedly tried to break down.